094661- Cut this 55.32oz. 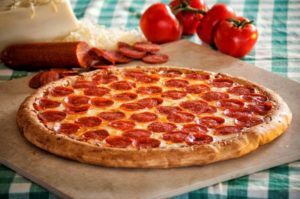 16″ Round Whole Wheat Self-Rising Pepperoni Pizza into 8 equal servings of 6.91oz. Each 6.91oz serving provides 2.00oz. equivalent meat alternate, 3.50oz. equivalent grains, and 1/8 cup red/orange vegetable for the Child Nutrition Meal Pattern Requirements. 2. Remove fully frozen pizza from all packaging and cardboard. Place directly on middle oven rack (about 8 inches from bottom of oven). For a softer crust, preheat and bake at 400° F for 23-30 minutes. Pizza should be placed on cookie sheet during baking. For a crispier crust, preheat and bake at 425° F for 19-26 minutes. Pizza should be placed directly on rack during baking.